Though they may vehemently deny it, the Swedes are quite similar to their neighbours, the Danes, in many ways. But, if there’s one uniquely Scandinavian concept that truly cements this congruity, then that would have to be the Danish word hygge (pronounced “hoog-uh"). Said to be a state of being that’s characterized by the warmth and cosiness enjoyed with friends and family—mostly over an intimate meal—hygge has long crossed borders into Sweden. Come spring, and one sees a host of such hygge-centric activities in parks, by lakes, in backyards all across Sweden, celebrating the long days and short nights. Singing the famous Swedish drinking song Helan Går—which when loosely translated into English means “chug it down"—couldn’t be more appropriate than at a surströmming party. In fact, it is imperative, as you find yourself knocking back shot after shot of the potato alcohol aquavit, once you’re done with your first bite of surströmming. This northern Swedish delicacy that dates back to the 16th century, originating in the Höga Kusten region of Sweden, is a super-stinky appetizer of fermented herring. Baltic herring are caught in the spring, salted and left to ferment, before being stuffed in a tin about a month before it hits the tables and shops. The fermentation process continues in the tin; “souring", as the Swedes refer to it, and results in a bulging tin of fermented herring with an intensely pungent aroma. Usually enjoyed by families and friends in early fall and more specifically on the third Thursday in August, by when the fish will have “ripened", a surströmming party is always held outdoors. And justifiably so. The ceremony behind opening and serving a can of surströmming has its own rules. Check the direction of the wind first, or risk fogging up everybody present with a blast of the noxious odour. Make sure to have on hand a few “back-up acts", no matter how benignly mild surströmming actually tastes. These take the form of the typically Swedish circular hard bread called tunnbröd, with a little bit of herring and the sour cream-like gräddfil spread on top, along with a garnish of dill fronds and onion rings. All this, topped off with slices of boiled potato to take the edge off of things. If only. While traditionalists may bicker about which came first, the Louisiana crawfish boil or the Swedish crayfish party, both their underpinnings couldn’t be more alike. In that, they both are about enjoying copious amounts of freshwater crustaceans, and the company of each other. 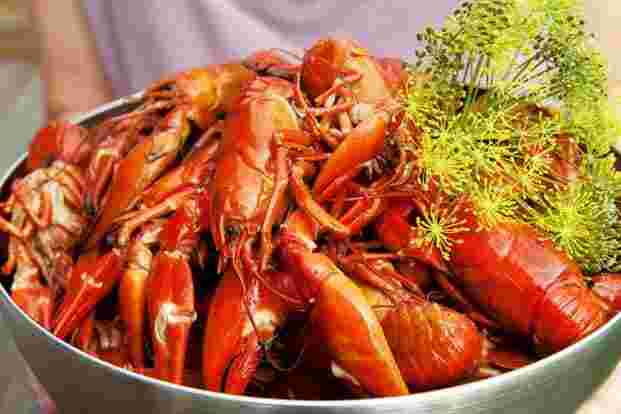 Known as a kräftskiva in Sweden, and marking the end of summer, a crayfish party may seem reassuringly informal, but that’s not often the case. Remember, we’re still talking about the rules-obsessed Swedes! So, this means people gathered under white tents, wearing funny hats in the shapes of cones with colourful prints, drinking snaps (the term for shots of aquavit) and eating boiled, peeled crayfish called kräftor placed in huge, almost pool-sized bowls after dunking them in aioli, and rounding it all off with a savoury pie made from the aged Västerbottensost cheese. Imagine having something like a mandatory, daily coffee break written into your job contract. Or picture yourself sitting down with the family every day over a plate of warm cinnamon rolls. Well, for the Swedes, this isn’t some halcyon dream, but an everyday reality. A clever syllabic play, the term fika is a spoonerism for kafi, as coffee is spelled in Swedish. It is also, hands down, one of Sweden’s greatest downtime pursuits that almost everybody in the country enjoys daily, with its two lynchpins being kanelbulle, or cinnamon rolls, and coffee. The latter is no great surprise. As the world’s second highest consumers of coffee, after their north-eastern neighbours, the Finns, the Swedes have perfected the art of celebrating the beverage and all the trappings that come with the seemingly simple act of drinking it. But then again, fika is much more than having a coffee. It is a social phenomenon, a legitimate reason to set aside a moment for quality time. Interestingly, many companies in Sweden have made it mandatory for all their workers to have a designated time during the day for fika. Even Sweden’s most iconic flat-pack furniture and home décor brand Ikea, strongly endorses the fika concept, as is apparent from a paragraph about it on its corporate website: “More than a coffee break, fika is a time to share, connect and relax with colleagues. Some of the best ideas and decisions happen at fika."